These only fit RIP Boards sold after 9/20/17. If purchased be for this date you will need to contact us for the updated part. Lamonster RIP Boards are the most exciting product to date for the F3 and now you can add a highway bracket to stretch out on those long lonely roads. The brackets are in a fixed position that will not rotate or move when resting your feet. Like all Lamonster products these have been road tested and adjusted to give the rider the perfect fit and feel. These are geared toward long legged riders that need another option for foot placement. Designed not to interfere with the brake or shifter. Installs in minutes. They work great and look great too. 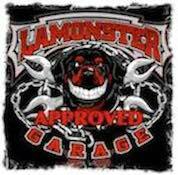 Quality is second to none as you've come to expect from Lamonster products. Having one of the first RIP Floor Boards positioned my cruise pegs too close to the new water bottle set up, so these brackets repositioned the angle of my left leg so it didn't hit the bottles. After tapping a few mounting holes, the new brackets were perfect. Well made, easy install. Another top quality product from Lamonster Garage. This will allow the rider a means in which to stretch out their legs.